The fad for changing registrations – for whatever reason – strikes again. 8031 PT is a 1962 AEC Reliance 4MU3RA with Plaxton B55F body, built for Economic of Whitburn, Tyneside We see in the rear view that there is an alternative plate, WNL259A. Seen in Showbus at Duxford on 28 September 2008. There has to be reason for this registration change, rather than a fad. Surely no owner would want to despoil their vehicle in this manner. If any owner does not keep up the Road Fund Licence on the vehicle or declare SORN, then its registration can easily be lost and if thats were the case, its nigh on impossible to reclaim it as the DVLA would then only issue an Age Related Mark, as we see here. Perhaps there is another reason but I think this the most likely. Mike, thank you for your comment. I was thinking in particular of those operators who change their normal UK registration to a Northern Ireland one, or a so-called ‘cherished’ one to disguise the age of the vehicle, rather than those which have been off the road for some while. I always thought that small coach operators did this to disguise a second (or third…) hand vehicle bought with a year letter. Plaxton or Van Hool bodies did not otherwise date a lot (for example) and this is why we had so many seemingly N.Irish registered coaches. This has rebounded a bit here as A regs were I think, quite rare? "A" reg (1963) was quite rare because only a limited number of Counties or Boroughs had run out of registrations. Some more came on board with year letters in ’64 and the year letter "C" (’65) was the first year when it became universal. The re-registration might not have had anything to do with the preservationist who I’m pretty sure would have considered the original registration to have been very much the ‘fabric’ of his/her pride and joy. Mike is correct regarding the non-use of a registration number renders it lost. The original registration of this bus would have been worth a reasonable amount of money and may have been sold and re-used on another vehicle before the bus was sold into preservation and as a result, without tracing the current owner of the plate and paying a princely sum to buy it back, they would have to settle for what DVLA would assign – like the ‘A’ suffix plate now carried. Another option, if one didn’t like the latter style, would be to perhaps try and buy a lower cost dateless plate the likes of which are often seen in magazine and newspaper adverts and on the internet. WSV*** plates can be seen on preserved vans and cars. These look near enough right and in keeping with those types of vehicle but in the bus world they are second best because the enthusiast world knows a lot more about what registration numbers are what. (As I write I have just searched on the internet for a ‘low cost’ dateless registration plate and see that it would be around £600-700 for a number plate with an ‘X’ in it like 790 XUU (not as widely sough after as initials as there are few personal names beginning with ‘X’ and ‘U’ I suppose). A possible example of settling for a close alternative, although I am not sure if I am correct with my assumption, is the preserved former Northern General Routemaster RCN 699 which became PCN 762. See http://www.nebpt.co.uk/index.asp?pg=31 which states that ‘This vehicle originally carried registration number RCN 699. It was re-registered as EDS 508B and later given the number it now carries, PCN 762, another Gateshead registration from the same period’. A modern day commercial coach operator wishing to disguise the true age of a coach would be able to buy a quite low cost Northern Ireland plate from the aforementioned website for only £49. This is peanuts to them really if it means that the passengers don’t then know just how old the coach they have hired really is. It is true to say that one of the prime reasons for operators putting dateless number plates on their vehicles was/is because the public would moan like nobody’s business if anything other than ‘this year’s coach’ turned up for them even though it might have cost around £300k or maybe more only a few months before. Adding a £600-700 ‘XUU’ plate on such a vehicle is worthwhile (but perhaps it should be left until the current year number is old hat). Park’s of Hamilton is an operator that has been into dateless number plates in a very big way for many years. Their collection of ‘HSK’ plates has been used over and over. Is it me or does the current system of using year identifier numbers like 14, 54, 15, 55, 16 etc not have quite the same impact as it used to when we used ‘year letters’? Answer to mystery of registration plate 8031 PT/WNL 259A. The history of this coach is new to Economic Sunderland in 1962 spent its entire service life with them. Coach was sold to local Tyneside Jazz Band where the original registration was unfortunately sold on, date unknown no known name of purchaser either. 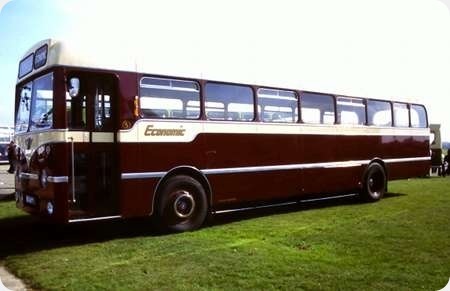 In 1985 coach was purchased by Purvis Brothers of Seaburn Sunderland ( Alan & John ) it was restored in 1989 -1994. A photo during restoration dated 1991 shows coach with registration of WNL259A. The plate being white with Black lettering and numbers in another of Peter Davis previous posting this figuration of number plate was raised. After restoration and later shown on the rally circuit coach is next seen in 1997 at Wetherby here it is showing the registration plate 8031PT a black plate with White lettering and numbers. At a show at Seaburn Sunderland in 2006 the coach was in ownership of Robin Hawdon of Gainsborough showing WNL 259A ( Ex 8031PT) from which no further details can be found. It would appear and it is only assumption that the plate seen on the coach at Wetherby 8031PT was to show coach as it was originally however as the Purvis Brothers drove their restored coaches to shows this would clearly show to be incorrect assumption.Well known in the preservation society the brothers may well have repurchased the registration whilst retaining WNL259A this enabling them to interchange plates. From information I have about this bus it is reregistered WNL 259A & displays this when on the road to rallies & the owners have 8031 PT plates which are temporarily fixed when off the public highway, I saw it at Wakefield in 2013 with 8031 PT on the front & WNL 259A on the rear! One other thought, prompted by something Alan wrote, was that during the time the former Northern General Routemaster carried EDS 508B as its official registration for use on the roads, that plate was covered up with a ‘display plate’ bearing its original number RCN 699 whilst on show at a rally. 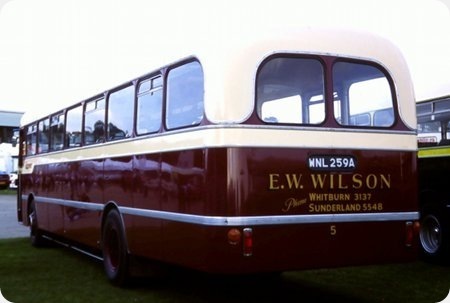 It might be the same situation with regard to the Economic bus seen at the Sunderland rally in 2006 perhaps displaying 8031 PT on a ‘show plate’. Thank you for your further comments, folks. Yes, it shows PT on the front . . .
Today 24/Sept/15 I have found photo of 8031PT showing to Hoults’ of Newport, East Yorkshire more research is needed if found I will post ASAP may fit in between Byker Jazz Band and Purvis restoration coach is seen in same livery. I ask does anyone know of Hoults, in picture it looks like it could be used as building contractors bus or a owner driver ferrying coal miners. 8031 PT did pass to Holt of Newport in October 1976 and was used as a PSV by Holt until July 1977. I saw it stored with DTE 772B in the Gilberdyke area circa 1978/9. I have a note of DTE being noted under tow in York in February 1979. Alan, 8031PT was with J.A.Holt (Holt’s Coaches) of Main Street, Newport, Brough, East Yorkshire until 1978 when it passed to Byker & St Peter’s Jazz Band. It was re-registered to WNL295A in January 1985, the month that it was acquired by the Purvis brothers. The registration 8031PT is currently on a Nissan X-Trail, presumably owned by someone with the initials PT. I would guess that the PT registration was sold when it was with the Jazz Band, and that the Purvis brothers had to apply for the WNL-A registration in order to get it back on the road. Transdev Keighley are in the process of upgrading the vehicles designated for the 662 Shuttle Service (Keighley – Bradford) and as well as interior re-furb Wi-Fi etc they have applied a pleasing blue livery and re-registered this 2005 batch with Northern Ireland plates bearing all or part of their fleet numbers. On a separate subject I also note that they seem to have abandoned the constantly scrolling destination screen displays opting for a simple fixed ultimate destination in most cases other than on service 66 to Skipton which has a scrolling message advertising the newly increase frequency. David Hick/Dave Farrier. Thank you for your notes. David the photo I saw see’s 8031 on snow covered ground in Chucklebuster photostream date unknown. I have asked for date/place, a dealers yard maybe. Coach is next to OBE 582E showing to McMasters albeit in a distressed state (OBE) that is. BLOTW, under the More button is 73 photo’s of 0831 PT also listed as Everyone’s photo’s. Northernblue109 shows a fictional image of this coach to a PTE Tyne & Wear in Yellow livery. David/Dave from your notes I suspect photo in Chucklebusters to be dated pre-1978 as it went to Holts in October 1976 thus giving indication of when photo was taken,I am awaiting confirmation of exact date. The Registration 8031 PT according to DVLA now belongs to a Nissan Made & Registered in 2011. Hope this helps. On this topic, how does our 1962 Ribble Titan – this week’s star bus- carry an unreversed six digit registration when other offices were near the end of their two reversed series. Was trade slow in Preston or did Ribble have an arrangement? In answer to Joe, Preston County Borough as it was then, were using UCK early in 1964, when some other authorities, including Lancashire County Council (also based in Preston) had already used ‘A’ suffix registrations. Soon after the UCK, Preston went on to ‘ACK…B’, as in the Ribble Panther ACK 774B seen elsewhere in these columns. I was never aware that Ribble had the sort of ‘arrangement’ that is sometimes said of other operators. The interesting bit, Pete, is that many other authorities had, by 1963, rotated through the reversed cycle 1234 CK and 123 ACK to 9999 and 999! Preston hadn’t it seems got off first base? Perhaps the registration experts have a view…! I am aware, Joe, that some of the Scottish authorities were still using the two letters then four numbers arrangement in 1964. Yes, I hope some of the registration experts on here are able to enlighten us. Well you’ve set us thinking Joe. Up here in Yorkshire Bradford issued YKW in December 1962, closely followed by YKY in February 1963 and reversed KW in April 1963. Huddersfield reached YCX in April 1963 followed by YVH in June the same year, whereas neighbouring Halifax had only reached TCP by November 1963, with TJX being issued from February 1964. Halifax did just start issuing UCP after TJX but then almost immediately moved to ACP-B. I remember regularly seeing a blue Morris Minor 1000 registered UCP 15 but it was not only the highest UCP I ever noted, but also the only UCP I ever saw too, so there can’t have been many more. Further to the 2 letters and 4 numbers question. I can find the following authorities which were still issuing in such a format. A number of authorities were still issuing 2 letters and 4 numbers up to the end of 1963 when they changed over to issuing suffix marks. Bute was one of these who had got to SJ 2860 before commencing suffix marks on 2nd January 1964. SV Kinross was another which got to 3722 before commencing suffix marks on 2nd January 1964. Further to Brendan, above, Huddersfield were one of a handful of authorities which were permitted to commence year suffix registrations rather than start on reverse issues. That accounts for the unusual start date of 28/8/63 instead of the first working day of a month. Other Authorities which commenced issuing Suffix marks at other than the start of the month were Middlesex 18/2/63, Plymouth 12/9/1963, and Oxfordshire 6/11/1963. As the Suffix system got in to full swing during 1964 authorities like Blackburn 28/1/1964, Monmouth 27/2/1964, Worcester 9/6/1964, Holland 10/7/1964, and Grimsby 24/7/1964 started at dates other than the start of the month. 20 Authorities started issuing on 4/8/1964 for some reason, perhaps it was a Bank Holiday. From then on things settled down with 16 authorities commencing on 1/9/1964, ending the ‘B’ suffix mark. 21 offices completed the process with ‘C’ marks on 1/1/1965 never having issued ‘A’ or ‘B’ marks. I’ve noticed the DVLA are issuing a lot of age related plates with an FT (Tynemouth) index. They are generally number first, then whatever, FT. I have owned and rallied this bus since 2006 and I regularly explain to people about the registration number. So instead of all the speculation and criticism why don’t you just ask me? I spent the Spring, Summer and Autumn near Stranraer, Wigtownshire, in 1958. At some point during this period, registrations went from OS 9999 to AOS 1. It was quite common in the 1980’s particularly among the hippy/traveller community to sell off valuable number plates. They were not bothered about keeping the bus/coach authentic, but putting a bit of cash in their pockets for ‘wacky baccy’. 8031 PT got replaced with WNL 259A (a Northumberland mark)in 1985, presumably the Byker Jazz Band needed a few £’s in their coffers, the original reg. number would have meant nothing to them, just an old bus to get them to gigs. The DVLA always issue an age related replacement number plate at the time of transfer, (vehicles are never left un-registered) in this case an un-issued 1983 A plate. As someone has already stated, only a few larger cities issued A suffix registrations, mainly London. At the time WNL259A was issued the DVLA used ones relating to the area where the vehicle was owned/kept at the time of transfer, now it can be from any area in the UK mainland. So unless the owner can trace the current owner of the original registration and buy it back (that may be a considerable sum assuming owner would sell) you are stuck with an age related replacement. One (much cheaper) solution is to fit the original plates to the bus whilst for show purposes at rallies.